The Men’s Health All-Terrain Race is the annual flagship event of Men’s Health Magazine. It is the most eagerly-anticipated races in the country by both mountain bikers and trail runners. The MH ATR is also the perfect springboard for new riders and runners to try something new and to push their limit. 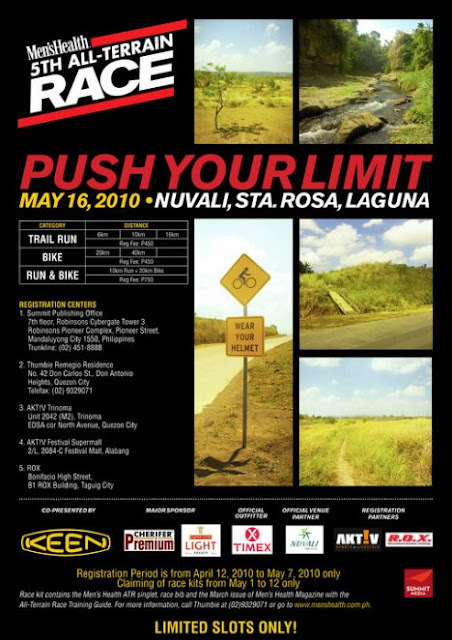 The 2010 Men’s Heath All-Terrain Race will be held in Nuvali, Sta. Rosa, Laguna. In this vast and naturally rich site in Laguna, participants will be running and/or riding on different types of terrain like pavement, dirt, compact dirt and grass. They will also be admiring the view on top of a ravine, and getting wet while crossing a river on their way to the finish line. Participants may choose to run the 6 kilometer, 10 kilometer or 16 kilometer trail course, or they can opt to ride their bikes on the 20 kilometer or the 40 kilometer route. But for those who really want to push their limit, there is also the option to do both: 10 kilometer trail run and 20 kilometer bike ride. Registration period starts April 12, 2010 until May 7, 2010 only. Onsite registration will not be entertained due to limited slots. Visit the website for the latest announcements. Participants may claim their race kits form May 1 to May 12 from the centers where they registered. The Summit Publishing Office is open for the claiming of race kits on weekdays, 10:00 a.m. to 6:00 p.m. (Office hours) only. Race kits include official race number, race singlet and the March issue of Men’s Health Magazine which contains the All-Terrain Race Training Guide.